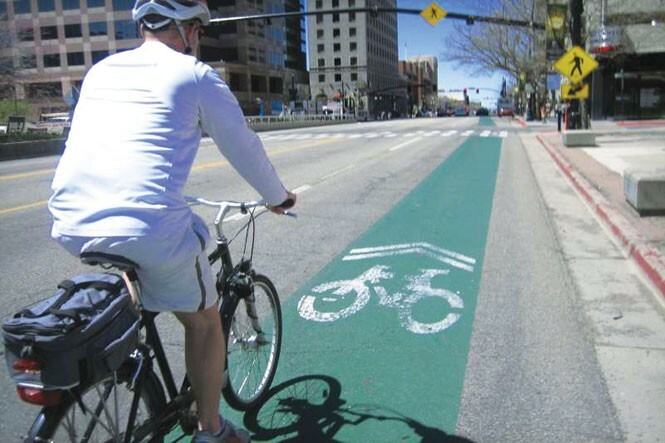 From its days as a destination for track bicycle races in the early 1900s to a 1970s proposal for protected bike lanes on Redwood Road, Foothill Drive and Beck Street, Salt Lake City has long been enamored with bicycles. But it has only been a decade since the city approved its first formal Pedestrian & Bicycle Master Plan, a document that carved out a place in the patchwork of streets and sidewalks for those who prefer a pounding heart and a little sweat to fossil-fuel powered propulsion. That plan, though, has run its course, and the city now has a draft version of its new Pedestrian & Bicycle Master Plan ready. The new plan, which the public can comment on until Dec. 17, touches on many areas that impact the lives of pedestrians and bicyclists, including signage, traffic-calming devices and traffic signals. But its main thrust is making biking and walking more inviting to residents who don't feel comfortable cruising the city's busy streets. This, city officials say, is a common concern for cyclists around the country and one that was echoed as the master plan was cobbled together. According to the plan, 50 to 60 percent of those who commented on the plan said they would be more likely to take up biking if they were separated from the traffic. To that end, the plan proposes 220 new miles of bike pathways over the next 20 years, many of which will be protected bike lanes, similar to those along 300 East and the ongoing project on 300 South. If this number of miles is completed, it will bring the amount of the city's arterial streets with bike pathways up from its current level of 50 percent to 85 percent. "It's true here, too, that people are saying that 'I would ride more often if I felt safer,'" says Robin Hutcheson, the city's transportation director. This fact, she says, "led us to put a little bit more in this plan about protection." The plan, Hutcheson says, is as much about pedestrian improvements as it is about bicycling. It calls for more mid-block crosswalks, which would include HAWK signage, which is like a traffic signal but remains solid red while a pedestrian is crossing, then flashes red for a short time, during which vehicles treat it as a stop sign, and then turns off altogether until another pedestrian presses the walk button. "I always feel like what we do for our walking environment is one of the most important things we can do," Hutcheson says. Other pedestrian improvement efforts will include "refuge islands" in the middle of the roadways and better pavement markings. For now, the plan is just that: a plan, Hutcheson says. She stressed that none of the proposals contained within are funded, and won't be until the plan undergoes public comment, is voted on and accepted by the city council, and then implemented piece by piece over the course of years or decades. But some pedestrian and bicycle projects are presently underway. Among them are improvements to a crosswalk at 1250 E. 800 South, near East High School, where HAWK signage will be installed to better manage the flow of students who cross there. A bike boulevard project, which is a low-traffic roadway with signage indicating that it's a bike boulevard, will be installed on 600 East. And a protected bike lane will be installed on 200 West. Hutcheson says this protected bike lane, unlike the one on 300 South, won't have any impact on street parking. 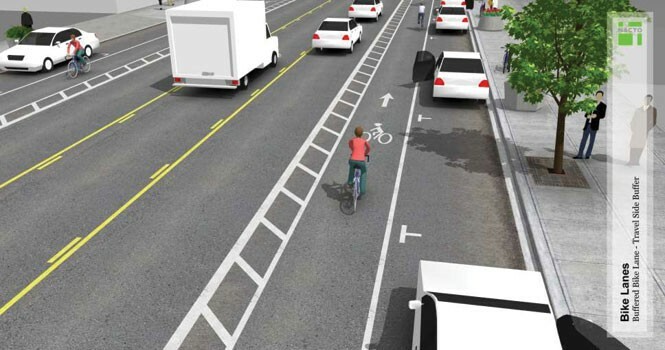 The 300 South protected bike lane, though, offers a glimpse into the city's bicycling future. Because surveys show it will lure more commuters onto bikes, the plan emphasizes "low stress" bike lanes. These include all-out separation from traffic, like what appears on 300 South, where parked cars, concrete curbing and planters separate bikers from traffic, and the lanes on 300 East, where bike lanes are buffered from traffic by painted lines. 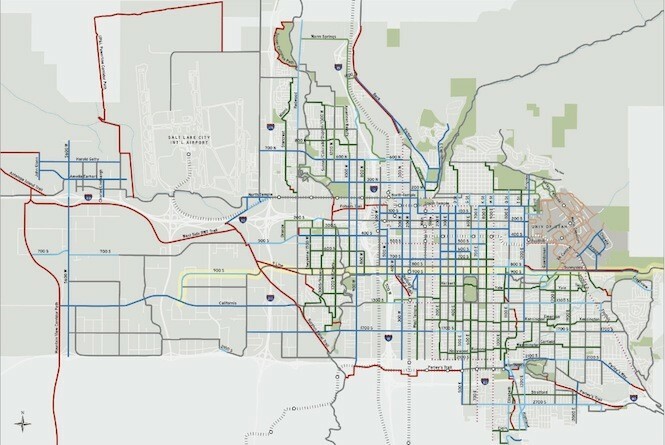 "Salt Lake City's established system of multi-use paths and on-street bike lanes enables a modest percentage of the population to feel comfortable traveling by bicycle," the master plan states. "People who feel comfortable riding in mixed traffic or in bike lanes adjacent to mixed traffic are generally able to access most places in the city currently. However, a much larger segment of the public would like to ride bicycles more but are discouraged from doing so by the currently available bikeways." These bike lanes won't be cheap. The 300 South protected bike lane, which runs between 600 East and 300 West, cost $900,000. According to the master plan, the 20 to 25 miles of proposed protected bike lanes would cost $600,000 per mile. An additional 35 miles of buffered bike lanes (lanes separated from traffic by paint) would run $25,000 per mile, while conventional bike lanes cost $20,000 per mile. These costs, the plan shows, are puny compared with construction on the freeway, where the recent Interstate 15 construction in Utah County cost taxpayers $55 million per mile. The plan says that all of Salt Lake City's pedestrian and bicycling improvements could be paid for just 30 percent more, or $71.5 million, than the cost of one mile of widened freeway. Hutcheson says the city received "tremendous" feedback from residents about what they want to see with the city's pedestrian and bicycling future, but the process is far from through. Many of the comments, she says, focused on interfacing bicycling with public transportation. A great number of other folks were concerned about the Wasatch Front's badly polluted air. Formation of the city's first public-transit master plan will commence this summer, Hutcheson says. Art Raymond, a spokesman for Salt Lake City Mayor Ralph Becker, says the draft version of the plan is "very much the beginning of the conversation." Residents can view the plan at WalkBikeSLC.com, and submit comments online at SLCGov.com/OpenCityHall. The plan, at 110 pages, is expansive, though limited in detail when it comes to actual costs for projects. Tom Millar, a bicycle and pedestrian planner at Alta Planning & Design, a consulting firm the city retained to create the plan, says cost estimates are scant because it's difficult to know how much money a protected bike lane, or crosswalk signal, will cost in 25 years. But the plan does provide an overview of the city's cycling history, including its early days before cars, when most people got around on foot, or on bike. Then, like now, conflicts came into play that were hammered out through policies like banning bikes from sidewalks, and efforts by bicyclists to pave the muddy streets. "By the 1890s, much like today, the increasing presence of bicycles in the city brought conflict that required action as well as a cultural shift in how residents went about their daily lives," the plan says. Millar says one of the key components of the plan is the large role that various educational and safety programs could play in the city's future. Some of these programs include school bike trains, where groups of students and parents ride to school together, and formation of "walking school buses," where parents and groups of children walk to school. Millar says city support for programs will help ensure residents know how to use the new bicycling and pedestrian systems. "They don't really do much if people don't feel safe, if people don't know how to bike," he says. "The programs, they give people a head start."